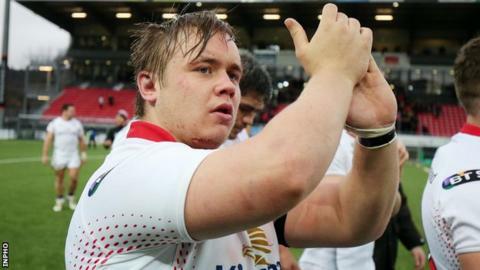 Ulster prop Kyle McCall faces 12 weeks out of action after undergoing elbow surgery on Monday to repair a torn tendon sustained in training last week. Fellow prop Tom O'Toole suffered a concussion in Saturday's win over the Scarlets and will follow the return to play protocols. Tight-head Wiehahn Herbst is fit again however and may play some part in this week's Pro14 game against Edinburgh. Marty Moore will not be fit to make his bow for the province however. The former Wasps and Leinster front-rower continues to work through a calf knock picked up in training last week. With Tommy O'Hagan also on the absent list with a perforated ear drum, former Connacht player Rodney Ah You may come into the reckoning for a first outing of the season on Friday. Herbst sat out the opening day win over last year's runners-up at Kingspan Stadium with an injury sustained at the end of last season. Andy Warwick and O'Toole were the starting props against the Scarlets, with replacements Ross Kane and Eric O'Sullivan both impressing off the bench. Back-row forward Jean Deysel is back in training this week after persistent struggles with his knee this summer but Friday's second game of the season comes too soon for the South African. Rory Best continues his recovery from the knee complaint which ruled him out of Ireland's successful summer tour to Australia, while fellow international Jacob Stockdale is expected to be missing until the end of the month. Knee injuries rule out centre Stewart Moore and flanker Clive Ross, while Luke Marshall, Louis Ludik and David Busby are long-term absentees.